Whether you are new to the carpentry scene or a seasoned pro, it is important that you understand the benefits of a tool belt. A tool belt can provide you with greater efficiency so you can get a job done faster and easier. Rather than having to dig around in a tool box looking for the perfect tool, you can easily gain access to it from your belt. As a carpenter, you likely get paid by the job rather than by the hour. If that is the case, you want to make sure you get the job done as quickly as possible. Choosing the right tool belts for carpenters can make all the difference in how quickly you get the job done. But choosing the best tool belt for carpenters can take some time sorting through options. Just a quick search brings up a long list of tool belts to choose from so how do you know which one is right for you? Fortunately, the comprehensive reviews below highlight some of the best tool belts for carpenters. Some of the things you want to look for in a tool belt is the ease in which you can organize your tools, plenty of room, quality material, and a comfortable fit. The belts listed below are some of the best that feature all of that and more, at different price ranges, to make your purchase decision easier. If you are in search of a top-of-the-line tool belt that is every carpenters dream come true, you need the Occidental Leather Tool Bag Set. Although it is the most expensive belt on the list, it is well worth the purchase price. As the saying often goes, you get what you pay for. Occidental Leather has manufactured top-notch tool belts since 1980 all throughout the U.S., which means they know a thing or two about quality. This is definitely the best tool belt for carpenters. Some customers felt the belt may have been a bit too bulky with one customer saying, Nice belt but way too big for me. I need smaller pouches.” However, sometimes bulky is good if you have a lot of tools you need to carry with you, especially for larger carpentry projects. Overall, this belt seems to offer plenty of incredible features that make it well worth the extra purchase price. When it comes to DEWALT, they certainly know a thing or two about carpentry. Best known for their DEWALT drills, the manufacturer has gone a step further with the DEWALT 31-Pocket Professional Carpenter’s Apron. If you are in need of a belt that is roomy and built for long-lasting, heavy duty work, this is the belt for you. If you are in need of a belt that provides plenty of space for all of your tools, this is the belt for you. With so many pockets to choose from, you will be able to carry plenty of nails and additional parts to get the job done. No more rummaging through a tool box to find what it is you need when you can easily access everything at your waist. There are a few customers who seemed a little displeased with the belt. One customer loved the belt overall but felt the padding on it got in the way. A couple of other felt the belt did not fit properly. For instance, one customer said, “This tool belt was too big for me,” and the other said, “It’s way too big and I am thinking about returning it.” Otherwise, the majority of customers seemed pretty happy with the purchase of the DEWALT 31-Pocket Professional Carpenter’s Apron. A few customers complained that the belt seemed to be lacking a bit in quality. One customer also felt that the belt did not necessarily fit all the way up to a 46-inch waist. Although there are a few apparent drawbacks associated with this belt, it seems like a worthwhile purchase. Considering the overall price, rating, and customer satisfaction, it is certainly worth a closer look. Each belt features on the list above is incredible in its own way. The DEWALT 12-Pocket Carpenter’s Suede Apron is an ideal choice for anyone looking to purchase a quality belt on a budget. 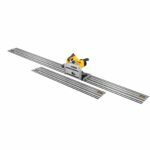 The DEWALT 31-Pocket Professional Carpenter’s Apron is also an excellent choice if you are looking for a highly durable belt. However, the Occidental Leather Tool Bag Set boasts the highest rating, therefore making it the number one pick for the best tool belt for carpenters.